There would be little argument that a decade ago Konus was a budget optic brand with more focus on price than quality. To be blunt, Konus made inexpensive scopes which were targeted to the casual price sensitive shooter. Minus recognized that the market has changed to demand much more sophistication and quality of optics. Konus responded by revamping the company and its entire product line. 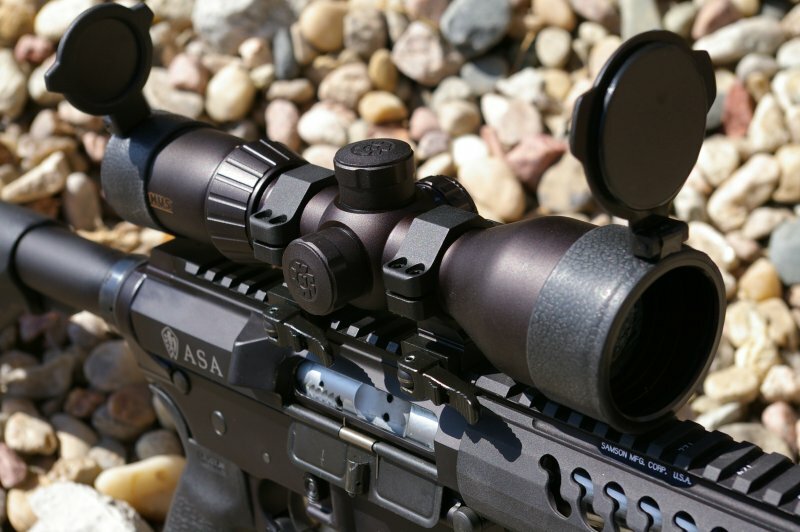 The company has moved from a budget line of scopes to their new Konus Pro brand with features like 30mm one-piece heavy duty construction, high clarity optics and etched reticles. 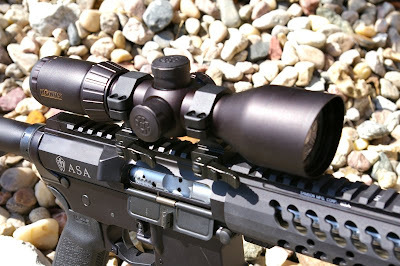 The new breed of Konus Pro scopes are far from the sub-$100 optics they used to be, however they still deliver a huge value in optics but now with features and quality expected on much more expensive high quality scope lines. I picked up the KonusPro T30 3x-12x44mm to top of my American Spirit Arms upper with a 16" bull barrel. The ASA upper has shown to deliver little tiny groups, however the huge scope originally mounted made the build a little unwieldy for such a short barreled build. Also, I found that typically I did not use the entire magnification range. The T30 was attractive to me because it delivers a full 3-12X magnification in a compact format and adds a dual illuminated BDC reticle for critter shooting in low light situations. Konus is a family run Italian company founded in 1979. The company began as a general optics company, manufacturing telescopes, microscopes and binoculars for educational, professional and personal use. In the late 1990s an American executive with a hunting background lead the development of the hunting optics category. Konus has taken a meandering approach from budget optic to feature rich high value optic. Konus hit the US market in 2006 with a budget line of optics which delivered more than any other optic in the price range. Today Konus has recognized that customers are demanding higher and higher quality in feature rich optics and have answered the customer demand with a new "Pro" line which features higher quality clearer optics with more features. The T30 from my experience certainly fulfills that promise. The KonusPro T30 3x-12x44mm offers a lot to the shooter. A very short compact size with a full 3-12X range of magnification, dual blue and red switchable reticle, recoil proof etched BDC reticle, 30mm tube construction, fully coated optics, dry nitrogen filled, waterproof, fogproof and shockproof design. 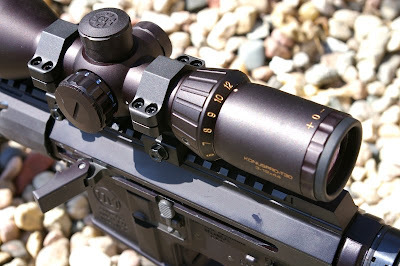 Over time I have become a fan of ballistic reticles and I especially like the KonusPro T30's 550 ballistic reticle. 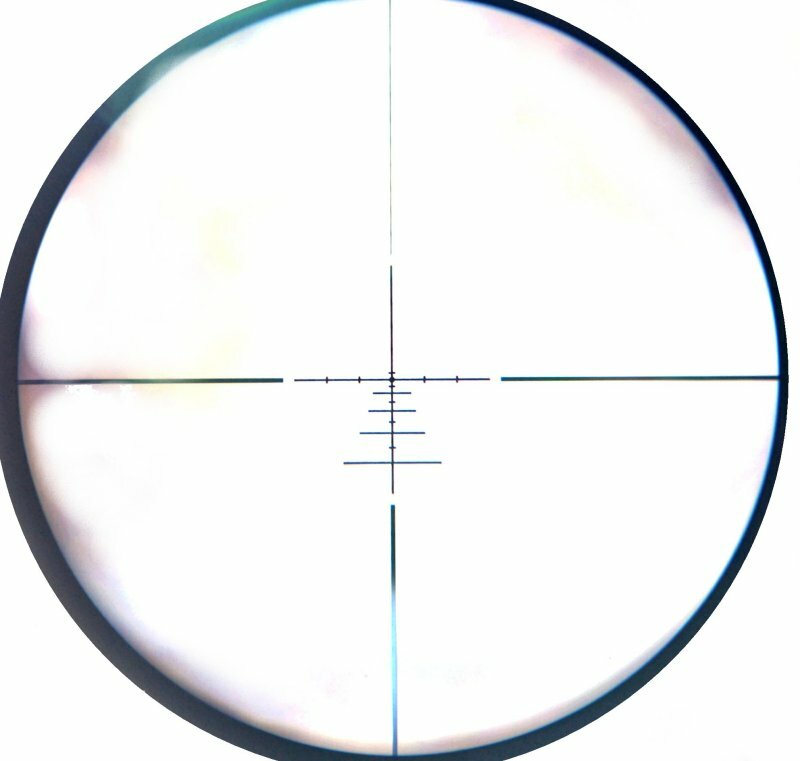 The 550 reticle is calibrated for the .55gr ballistic tip .223 Remington/5.56 Nato round from 100-550 yards with major horizontal hash marks at 200, 300, 400, & 500 with sub-tense marks at the 50 yard increments out to 550 yards. Lateral hash marks allow for precise lead holds for wind and moving targets. Functionally the ballistic scale seemed well tuned to a Hornday 55gr TAP round, but as with any scale your ammo’s, bullet BC, bullet weight, and overall velocity affect the actual trajectory. 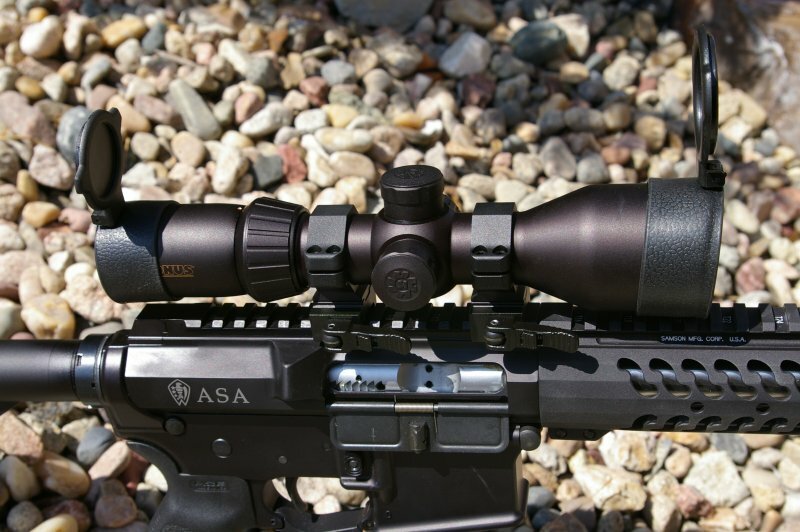 You may get lucky with your favorite round with the 550 reticle; if not simply knowing that the 300 yard hash mark delivers a perfect 275 yard shot with your 72gr rounds is still very useful. A little practice proves this can be valuable tools once you know where a certain round prints. The KonusPro T30's glass engraved reticle is a big deal because it makes the scope reticle completely recoil and shockproof. Generally reticles are the most fragile component of the entire scope, but by glass etching it, the reticle becomes totally shock proof. Typically this is a feature only found on very high dollar optics... such as in the $1000+ range, so it is stunning that a $225 optic is offering this feature. Other features are the front and rear flip up lens covers and the dual illuminated reticle. The scope covers are a nice add on, however they do not flip all the way open and provide a bit of obstruction to the view. The etched 550 reticle tree appears and functions as a dark black reticle with the illumination off, but with it on the red or blue illumination can be set at various powers. For dusk and late dusk the lowest power is actually low enough, but if you are in a 2AM hog hunt the lowest setting is still a bit too bright. There are only a couple optics I do not have this complaint with. One option is to use a older CR2032 battery that is nearing end of life with less power and will in turn deliver dimmer illumination. I use this trick for night shots on some of my other over illuminated optics. Some will argue that a 1” scope tube can be just as bright as a 30mm tube, however if this was the case NASA would not be using telescopes with 10’ lenses. For low light shooting my experience has been the more glass you have on the objective and the bigger the tube the brighter the optic will be. In this case the Konus Pro T30 3x-12x44mm scope offers outstanding clarity for the price point. What do you give up? My only two complaints are that the finish could be better and the turrets are feature lacking for the turret twiddler. My follow up comment on those points is that for this scope's function, I really do not care. The finish on the scope will probably get beat up anyway and based on the BDC reticle design, the turrets are a set it and forget it deal anyway and will likely never get touched beyond the initial zeroing after the turret covers are tightened. My favorite feature was the small size of this Konus Pro optic over the previous gigantic scope I had on the 1/2 MOA ASA 16" bull barrel. Admittedly the Konus Pro T30 was less powerful but delivers a ballistic dual illuminated reticle along with a still delivering a sizable magnification range. 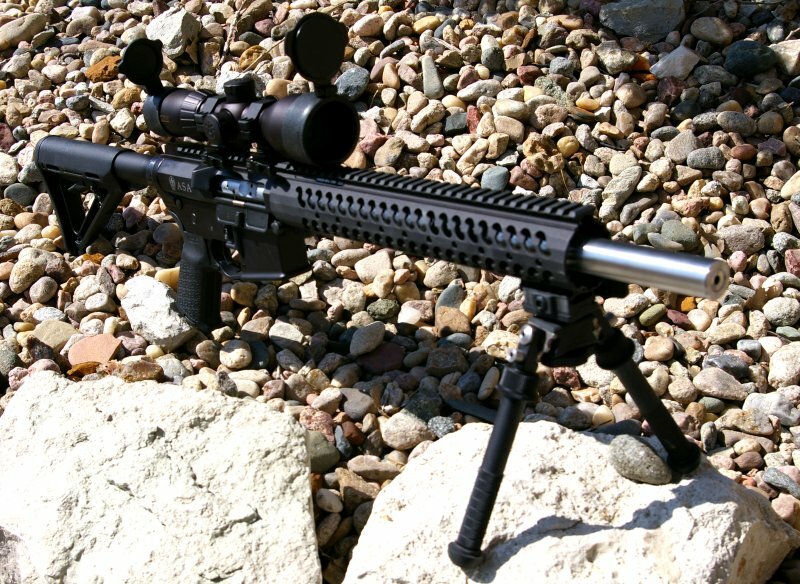 This fat little bull barrel gun tends to be a gun I shoot quite a bit because it hits what I point it at easily and this T30 3-12 scope is perfect for any precision shots out to 300 yards. 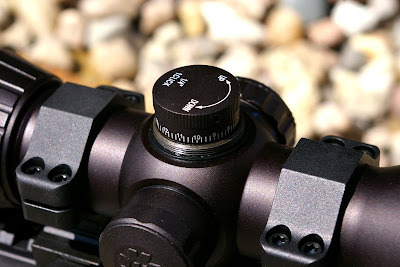 The Konus T30 does have a fixed 100-yard parallax, however beyond 100-yards, parallax is nominal within the range of this optic and the .223 round. If you are a prairie dog shooter, your might possibly be limited by the magnification and parallax adjustment, however for any critter larger, this is a great tool for a precision AR. Functionally the eye relief was flexible, the magnification ring was simple and smooth to control and the illumination controls were also simple and easy to adjust. The illumination is daylight visible but even on its lowest setting is just a tad too bright for me after midnight levels of darkness. The Christmas tree style BDC reticle tree provides hash reference marks laterally for rough hold offs for 10 MPH winds along with other Mil-subtense at the primary horizontal line. I wish Konus would have defined exactly what these hold offs were from a Mil-dot perspective though. A few wishes on the KonusPro T30 3-12x44mm scope would be for scope covers that flip all the way open to a near flat against scope position and an extra low light NV - Night Vision setting for those extra dark 2AM hog hunts. Other than those two points, the KonusPro T30 is definitely a new breed of Konus products than what I experienced in the past. The new Konus Pro delivers significantly higher quality, more features, and clearer optics all for less money than you would spend for most hunt ready optics. Konus... who would have thought a $225 optic could perform this good. Clear optict, fast to target, quick to sight in. Put this on a Rock River AR15 & think I'll try the 50mm lens version on a Black Rain 308. I am into shorter scopes on the tatical.